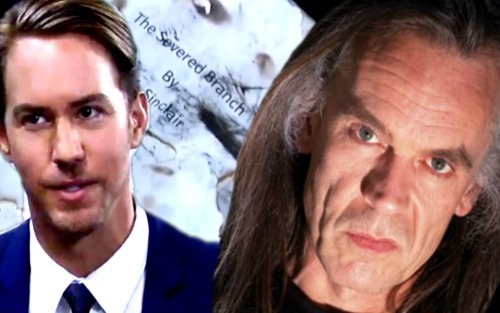 General Hospital (GH) spoilers tease that some shockers are ahead on the ABC soap. The suspense is building as Jason (Steve Burton) and Sonny (Maurice Benard) work to figure out the truth. Of course, Spinelli (Bradford Anderson) is pitching in as well. He’s been extremely helpful, but there are more leads to come. The drama will explode soon, so here are five bombshells to look forward to. GH viewers can expect Sonny to receive some mysterious info on next week’s new GH episodes, January 15-19. He’ll get a cryptic text, so it’s possible that the traitor will realize they’re closing in on him. Faison’s (Anders Hove) son may take precautions to avoid getting caught. Regardless, someone will definitely have something to share with Sonny. It sounds like the message will be quite ominous, so they may be on the right track. Anna was certainly jumpy when Jason and Sonny filled her in on the latest developments. She obviously didn’t admit to everything she knows. Anna mentioned that Desiree might be the mother of Faison’s child, but she hastily explained that the woman was dead. Is she telling the truth? Anna pushed Sonny and Jason to move on, so she must be keeping secrets that will eventually be revealed. General Hospital spoilers tease that Anna could very well be Peter’s biological mom. General Hospital spoilers say Maxie’s concerns will spiral out of control. As she deals with nightmares and potential premonitions, Maxie will seek help from Mac (John J. York). She’ll plot a quick getaway with Nathan, but that plan won’t pan out. They can run, but they can’t hide! GH fans will probably see a showdown between Faison and Nathan sooner or later. Nathan has Faison ties, but so does his brother. There’s another son lurking and it seems likely that it’s Peter August (Wes Ramsey). General Hospital spoilers say Spinelli will pass along another batch of useful hints. Jason will follow up on a lead that puts him incredibly close to the truth. It looks like it won’t be long until Peter faces the music. General Hospital spoilers state that the big reveal will come in stages. Peter is probably Faison’s son, but other mysteries need to be explained as well. The traitor’s agenda is one of them. GH will have to tell the story of what Peter had in mind for Jason. There was a reason for Jason’s clinic stint and it’ll be divulged in time. Are you excited to see all these shockers? We’ll give you updates as other GH news comes in. Stay tuned to the ABC soap and don’t forget to check CDL often for the latest General Hospital spoilers, updates and news.